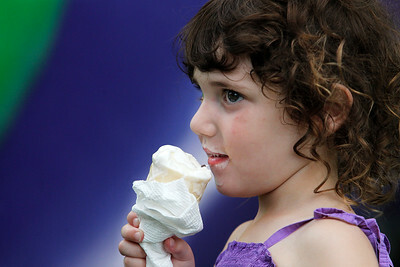 Matthew Apgar - mapgar@shawmedia.com Rachel Jacobs of McHenry, 2, enjoys a vanilla ice cream cone during an ice cream social for Fiesta Days on Friday, July 17, 2015 at Veterans Memorial Park in McHenry. Matthew Apgar - mapgar@shawmedia.com Tabitha Deibler of McHenry writes the menu on the window to the Riverside Chocolate Factory trailer during an ice cream social for Fiesta Days on Friday, July 17, 2015 at Veterans Memorial Park in McHenry. 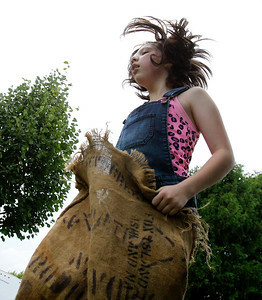 Matthew Apgar - mapgar@shawmedia.com Ashley Rioux of Wonder Lake, 10, hops quickly as she competes in a potato sack race against her sister Maggie during an ice cream social for Fiesta Days on Friday, July 17, 2015 at Veterans Memorial Park in McHenry. 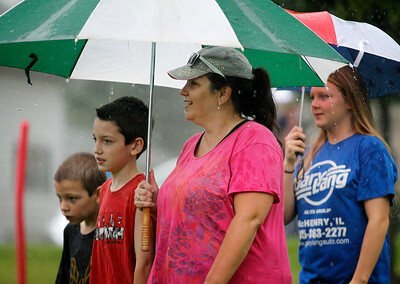 Matthew Apgar - mapgar@shawmedia.com Penny Wlasiuk of McHenry, along with her sons Danny, 9, left, Derek, 11, and daughter Melissa, 12, don't let the rain stop her family from having fun at the Fiesta Days ice cream social on Friday, July 17, 2015 at Veterans Memorial Park in McHenry. 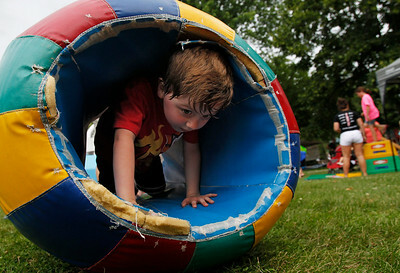 Matthew Apgar - mapgar@shawmedia.com Zachary Craig of Cary, 5, crawl through a colorful, padded gymnastics tube during an ice cream social for Fiesta Days on Friday, July 17, 2015 at Veterans Memorial Park in McHenry. 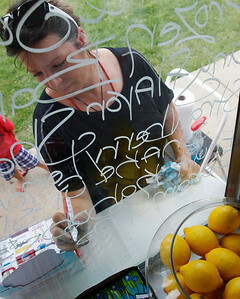 Tabitha Deibler of McHenry writes the menu on the window to the Riverside Chocolate Factory trailer during an ice cream social for Fiesta Days on Friday, July 17, 2015 at Veterans Memorial Park in McHenry.